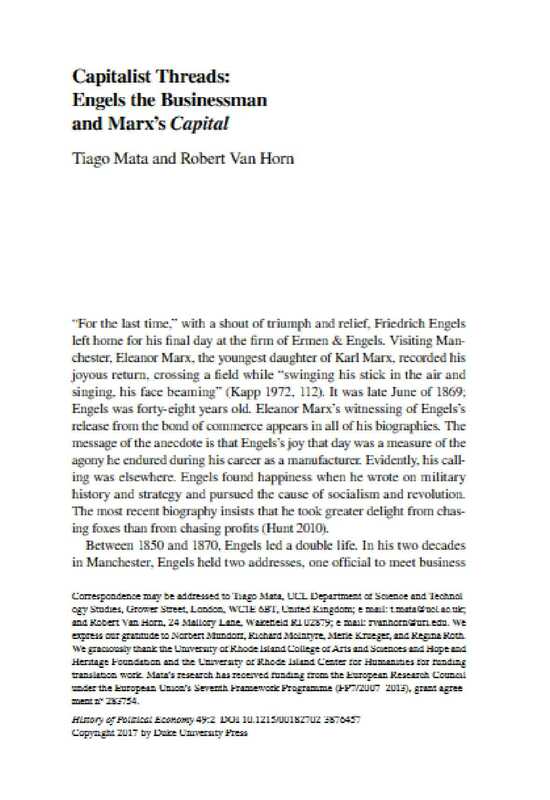 Capitalist Threads: Engels the Businessman and Marx’s Capital in History of Political Economy with Robert Van Horn, 2017, 49(2): 207-232. This essay illuminates a neglected aspect of Friedrich Engels’s life: his work at his family’s textile firm, Ermen & Engels, in Manchester, the hub of the cotton industry in the mid-nineteenth century. We argue that Engels was a merchant and an intelligencer with a detailed, comprehensive understanding of products and the movements of goods, orders, and prices in the global cotton trade. The statistical insights Engels gleaned on matters such as machinery depreciation and reinvestment, his contextualization of capitalism within a unified world market, and his recognition of the tendencies toward overproduction that threatened economic crisis, all contributed to shaping key ideas and themes of Karl Marx’s Capital Volumes I and II, leaving a lasting imprint on Marxist political economy.